A 15", 100W beastly guitar speaker for when you need big, deep tones. With a larger cone delivering an extended low end response, the 100-watt Fullback has a big, deep voice, delivering smooth and expressive tonesseemingly without effort. 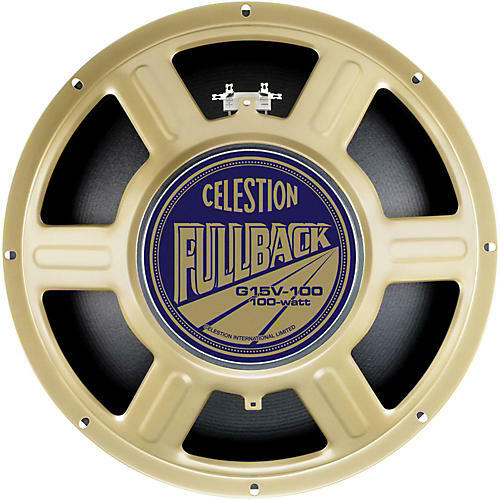 While retaining Celestion's classic, harmonically complex and finely detailed mid-range, the larger 15" cone of the Fullback shifts this characteristic down a register. Clean sounds are warm and expressive, revealing and enhancing the qualities of your amp and guitar without unnecessary colouration. Overdrive sounds are complex and musical; push harder for a weighty, contralto growl, with a softer, warmer mid-range. Incorporating an eight-hole chassis, the Fullback is theideal choice whether you'e looking for the perfect upgrade for your 15" combo, or you'e looking for an interesting tonal alternative to a 12" speaker.